Water-flow is a sensitive matter in home repair that usually blindsides novice contractors and severely compromises expensive improvements. Misdirected downspouts, clogged gutters and failing debris prevention rapidly destroy home equity and can wreck nearly every part of home construction when hidden. Even well-constructed homes are exposed to a barrage of elements that cause wear-and-tear. Don't let one bad storm turn a small water problem water into a bank busting renovation. More than any other facet or our work, anticipating and overcoming the unique challenges that water-flow holds for contractors demands the comprehensive approach we employ to protect your investment. 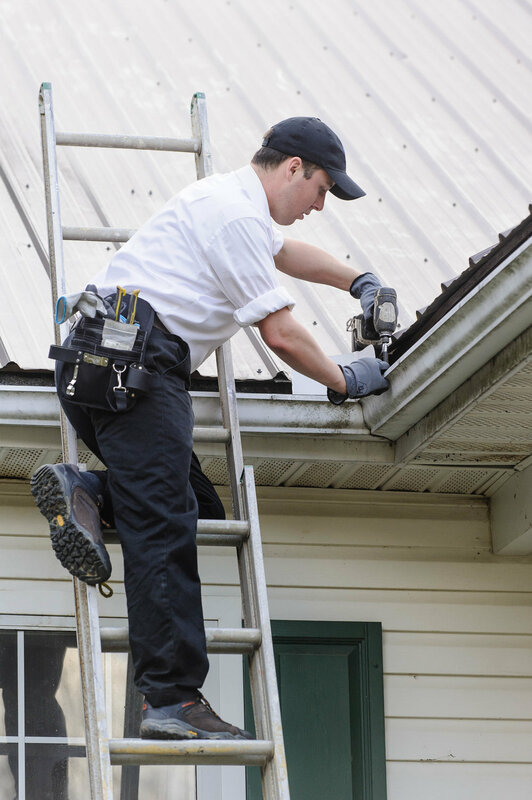 Recurring rot and wildlife issues can often be correlated with gutter failure or code oversights in the construction behind the gutters and continuous improvements like drip-edge, water divertersion, and gutter lock debris prevention can drastically extend the life of expensive home repairs in these areas. Making any custom changes on a structure requires careful consideration of the long-term water-flow. Do-it-yourself projects can bite you on the back end without long-term attention to detail and even professional projects often get blinders when working on a single project. Let us catch these issues before they hurt your investment by itemizing the causes and referring to the appropriate contractors when a problems necessitate insurance assistance.